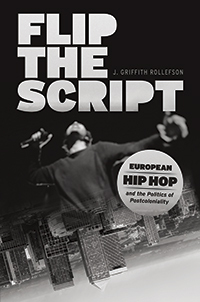 In my new book, Flip the Script: European Hip Hop and the Politics of Postcoloniality (University of Chicago Press, Chicago Studies in Ethnomusicology, 2017), I examine how the children and grandchildren of immigrants from the former colonies and peripheries of Europe are employing the musical protest strategies of hip hop both to differentiate themselves from and relate themselves to their respective majority societies. Drawing on music, media, observations, and interviews from fieldwork in Paris, Berlin, and London—as well as a conclusion centered in Cork, Ireland—this book situates musical analyses in Europe’s postcolonial and globalizing contexts to demonstrate how this black American music structures local concerns and enables syncretic expressions that are at once wholly local and definitively global. It concludes that hip hop is both a product of the postcolonial contradictions that hyphenate citizens within their own nations and a form of cultural politics well suited to flip the script on the inequalities those hyphens imply. In thinking about what section of the book would be best suited for a preview in Musicology Now, it occurred to me that it should not just clarify the argument and methods I use in the book, but offer a flavor of the analysis and argumentation – not just tell you, but show you what I’m up to. Indeed, that’s an explicit sort of meta-argument in the book: that hip hop’s performativities call into question the form/content binary, both in our musicological analyses and in society more broadly. Sometimes it’s not what you say, but how you say it. And usually it’s both. As such, I settled on an excerpt from the conclusion that focuses on one track from Cork, Ireland to model my use of musicological, ethnomusicological, and cultural studies methods in attending to hip hop as musical sound and lived culture and performed politics. While the ethnically Irish voices in this excerpt are slightly divergent from the people of color whose voices lead the book, this snapshot unearths the postcolonial entanglements that make it abundantly clear that we need to think seriously about what hip hop has to say within a larger global and historical frame. Lest we forget—the streets were red with the enemies! Lest we forget—the lessons learned in our memories! At ground level, they’ll reform, rebound! In flippin’ the script on Kipling’s battle cry of imperial dominion and contemporary expressions of British patriotism, the Irish duo localizes their politics of postcoloniality while drawing on hip hop’s well-established inversional practices. The track is thus a contrapuntal construction that, following Said, builds “both processes, that of imperialism and that of resistance to it” into its politics of postcoloniality. This is also the KoS practice that Q-Tip suggests is “universal if you’ve got Knowledge of . . . Self.” And as we will see in a moment, Brosy and Mickey Gatch’s commitments to and understanding of such practices in the African American context go far beyond a basic knowledge of hip hop’s poetic devices. All told, Kipling’s poem extolls the thankless but paramount task of bringing those Wretched of the Earth “(ah slowly) to the light” from their “loved Egyptian night”—the task, that is, of the civilizing mission. As such, “The White Man’s Burden” brings this book full circle, first in its suggestion that the colonial imperative, with its chattel slavery, white supremacy, and structural racism, is the Enlightenment’s sine qua non and second in the way we find that even a cursory look into Irish postcolonial hip hop will necessarily lead us to colonial entanglements in England, the Philippines, the United States, and further afield. Indeed, we are in an age of deeply interconnected globalization. But if this book has shown us anything, it is that any discussion about contemporary globalization must begin by laying bare the deep and enduring legacies of imperialism, colonization, racism, and slave capitalism on which globalization is founded. This is especially true in the realm of the culture industry. Indeed, to revisit Said, “Imperialism consolidated the mixture of cultures and identities on a global scale. But its worst and most paradoxical gift was to allow people to believe that they were only, mainly, exclusively, white, or Black, or Western, or Oriental.” We are all mutually implicated, but imperialism’s enduring myth of an emancipatory light that must beat back an imprisoning darkness has atomized the particular at the expense of the universal—a counterintuitive Enlightenment transaction that Etienne Balibar fittingly calls “Racism as Universalism.” The irony is almost as rich as the thanklessness met by Kipling’s civilizing slavers. If Kipling’s parallel structure provides the form and foil for Brosy and Mickey Gatch’s myriad postcolonial linguistic inversions (and subversions) of British civility and authority, then the beat composed by Kanturk-based producer D’Beats offers a simple but suffusive and all encompassing sonic inversion of the British colonial gaze. A telling feature of the musical setting, which is easily missed, is that these hip hop artists construct their postcolonial political critique by articulating the swing and swag of their localized hip hop style to the melodic and rhetorical resonances of the song “Stranger in Paradise.” The entire track is constructed of a hip hop drum beat overlaid with a repeated and stuttering two-note, wordless loop built on the song’s signature motivic feature—an uplifting and transcendent rising fifth interval (B flat to F) performed by a rounded and vibrato-laden female voice. The hit song is from the 1953 Broadway musical Kismet (Arabic: destiny, fate), based on the exoticizing 1911 British play of the same name. Although “Stranger in Paradise” is built on a musical quotation of the main theme from Alexander Borodin’s “Gliding Dance of the Maidens” both pieces were composed to evoke an exoticizing romance in the feminized space of a pastoral garden paradise. What’s more, Brosy explained that the track was written amidst the backdrop of the Arab Spring: “as the Arab Spring was just getting off the ground at the time and we were both transfixed by the events we felt if we could make a song about Irish rebellion, that could be juxtaposed over any Arab city and still make sense.” As such, in choosing the Kismet sample and linking it to a track about colonial occupation, anticolonial struggle, and the Arab Spring, Brosy and Mickey recast the “stranger” signification as “occupier.” As detailed in chapter 5’s discussion of M.I.A., the sample also resonates with a long history of imperial discourse that equated the virgin female body with the untapped resources of colonial Africa, Asia, South America, the Caribbean islands, the Pacific islands . . . and Ireland. Ireland has long served as something of a banana republic, functioning as a breadbasket—or better, butter crock—for the British Empire and a summer home for countless English nobility. Though it is becoming a leader in high-tech industries (or perhaps more accurately, a tax haven for international corporations) it remains a relatively underdeveloped agricultural hub that is only now recovering from an early lesson of globalization-as-postcoloniality. At the time of writing, it faces continuing IMF, EU, and European Central Bank imposed austerity measures in the wake of the 2008 global banking crisis (read: money grab). It should not surprise us, then, that the Irish people see all too clearly the connections between colonial structures of subservience and global economic practices of the new imperial structures. Thus, “Stranger in Paradise” functions through hip hop consciousness to bring into form The Good Vibe Society’s critique linking the exoticizing colonial gaze to the Irish War of Independence and, as Brosy put it, to “those who still fight for freedom around the world today.” In constructing their multimodal cultural politics through an articulation of local and national revolutionary histories to the globalized rebellion of hip hop and the imperialist orientalism of Kismet, these hip hop artists construct a usable politics and voice a def critique out of an array of histories. The MCs and their DJ construct an internationalist identity perched on moral high ground while simultaneously engaging national pride and militating against occupation of their “paradise,” the proud and pristine Emerald Isle. At the end of the video for the track, the romantic strains of the “Stranger in Paradise” loop continue, and two quotes appear on screen. The first reads: “‘Damage of $20 million was done in Cork City on December 11th 1920’—The American Commission on Conditions in Ireland.” The second reads: “ ‘It is not to those who can inflict most, but to those who can endure most, that victory is certain’—Terence MacSwiney, Lord Mayor of Cork 1920.” The track concludes, but the video moves on to frame Ireland and establish solidarities from another US perspective. In a startling, but telling, conclusion to the music video, we are treated to archival footage of an interview with Muhammad Ali on an Irish talk show. In the summer of 1972, the boxer and anticolonial activist was in Ireland for a fight with Alvin Lewis at Dublin’s Croke Park and spent some time learning about the country and doing this extended interview with Cathal O’Shannon for the Irish state broadcaster RTÉ. J. Griffith Rollefson is lecturer in popular music studies at University College Cork, National University of Ireland. He has served on the faculties of music at the University of Cambridge and the University of California, Berkeley, where he also served as UC Chancellor’s Public Scholar. Rollefson’s research has been recognized by the British Academy, Volkswagen Stiftung, DAAD, ACLS, and European Commission and is published in Black Music Research Journal, American Music, Popular Music and Society, in the edited volumes Crosscurrents: European and American Music in Interaction, Hip Hop in Europe, Native Tongues: An African Hip Hop Reader, The Oxford Handbook of Hip Hop Studies, and elsewhere. His book, Flip The Script: European Hip Hop and the Politics of Postcoloniality (University of Chicago Press, 2017), was supported by the AMS 75 PAYS Endowment. I'm using several chapters in this book as the reading for the last unit in a class on music and oppression. This blog post will be a great addition to the reading list. Thanks for your fascinating scholarship. Thanks so much Kristen! Do be in touch if you need anything and I'll post to the website - EuropeanHipHop.org.